Cubital Tunnel Syndrome: The funny bone, is a well-known point located behind the elbow where a tap with the right force can cause pain and a tingling sensation to trail down the length of the forearm. 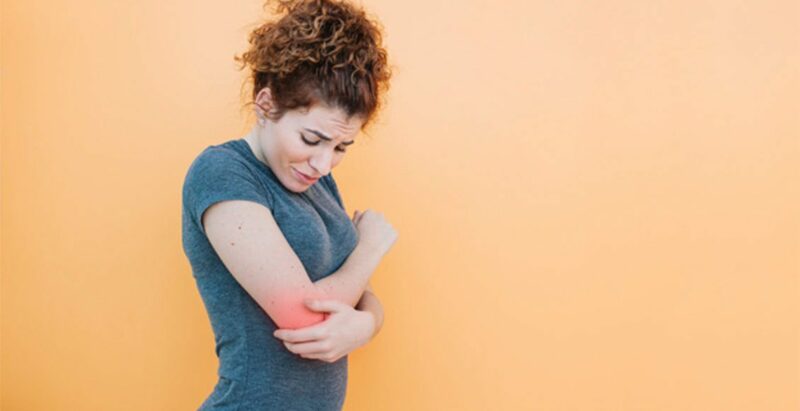 The sharp pain to the elbow normally disappears soon after but some individuals experience the same type of symptoms due to another condition targeting the elbow. Cubital tunnel syndrome occurs when there is an impingement of the ulnar nerve as it passes behind the elbow and on the inside portion. Because there is no muscle to function as a cushion to protect the ulnar nerve, often times, it can become trapped between the bone and the skin in a tunnel called the cubital tunnel. Cubital tunnel syndrome is the second most frequently known condition occurring in the arm as a result of nerve compression. 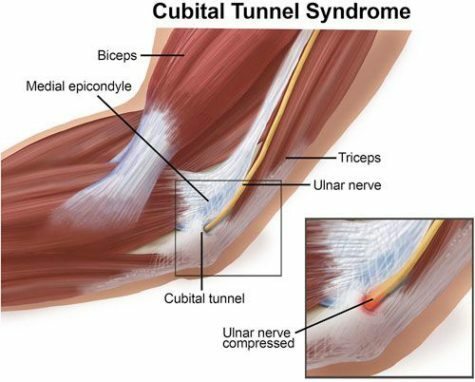 Cubital tunnel syndrome commonly results when the nerve is stretched or there is pressure for an extended amount of time. For example, when holding the phone, the arm is bent for undetermined periods, during which the ulnar nerve stretches inside the elbow and may progressively begin to cause nerve irritation. 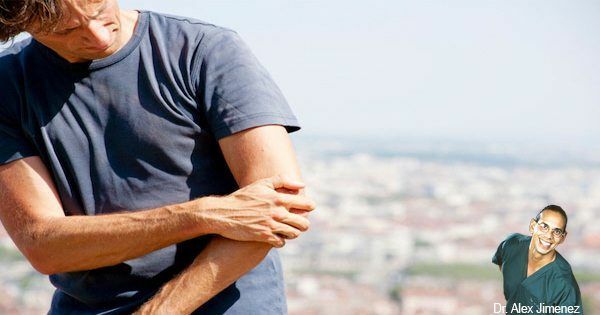 Also, prolonged compression on the nerve may result when the inside part of the elbow is pushed to lean against a hard surface, pushing the ulnar nerve against the bone. This condition can slowly develop over time or can even occur after trauma from an accident, such as a fracture to the elbow. 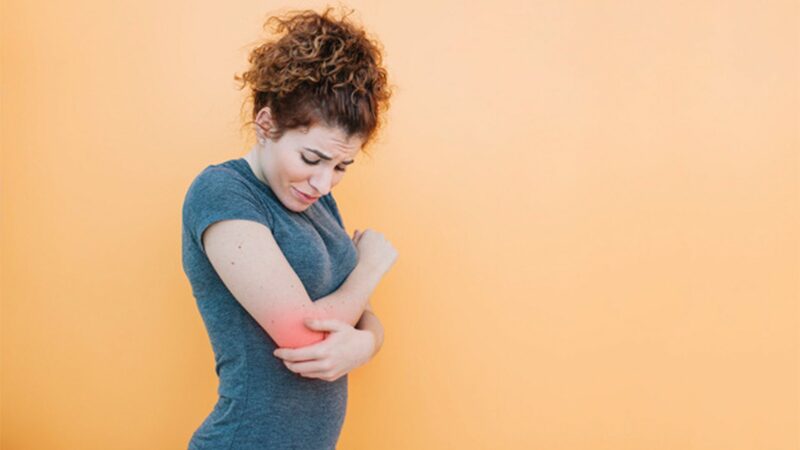 Regardless of the cause for cubital tunnel syndrome, symptoms include numbness and tingling sensations originating from the elbow that extend down the inside of the forearm and into the hand. Other symptoms include decreased sensation and tenderness on the elbow. Advanced cases of the condition may result in the individual having difficulty gripping and holding on to objects. Cubital tunnel syndrome can be treated without surgery, according to chiropractor Dr. Alex Jimenez. A physical therapist can easily diagnose a person’s level of the condition and follow by determining and recommending lifestyle changes to avoid further injury to the elbow in order to allow the irritation of the nerve to decrease. The physical therapist may also follow treatment with exercises to restore the range of motion to the affected arm and strengthen the surrounding muscles to aid in the rehabilitation.